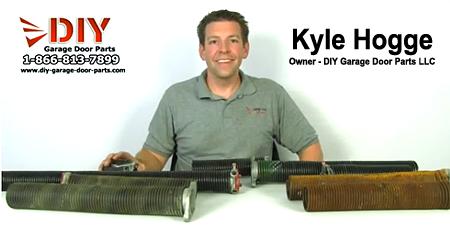 Owner Kyle Hogge from DIY-Garage-Door-Parts.com is putting in some serious overtime to compile a comprehensive list of questions he is frequently asked about our products from purchasing customers. Please come back soon as we know the information we provide here will be of extreme value to our past, present, and future customers. Question about the garage door spring I ordered: The invoice states, as I ordered.207x2x21, what I have is a larger wire diameter and longer length, I really need my door working again. It’s an aluminum 18×7 with no additional insulation or windows. will these springs work properly or was there a mix up. Anwser: When you placed your order you selected the longer 8 year warranty. This option is better than just a warranty is an ounce of prevention. The upgraded warranty is a higher cycle (LONGER LASTING) garage door spring. Most of the industry standard springs are only 10,000 to 12,000 cycles, but when this option is selected we increase the wire diameter in our spring software until we reach a minimum of 25,000 cycles. When the wire diameter is increased the length of the spring also has to change to lessen the lifting power down. So what you received is the exact same lifting power spring, but the same stress is distributed over thicker wire and over more coils so it the oil tempered steel breaks down slower, resulting in a longer lasting spring (2.5 to 3 times longer usually 15 to 20 years of use) and a garage door spring that won’t lose tension as fast (less frequently balancing the door in the future). Question about how how many turns do I wind up on the the 8 year warranty garage door springs? I recently placed an order for the 8 year warranty garage door springs and just wanted to know how many turns to put on the springs? Anwser: It will still be the same number of turns as your old garage door springs. 7.5 full turns or 30 to 31 quarter turns for a 7ft tall door and 8.1 full turns or 33 to 34 quarter turns on an 8ft tall door.